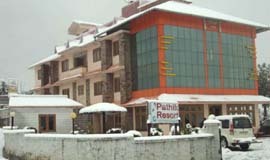 Transfer from Kathgodam to Mukteshwar.Check -inn at the hotel. 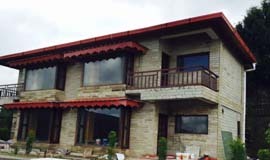 Local sightseeing in Mukteshwar. Overnight at Mukteshwar. 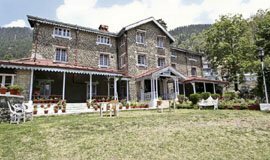 Local site seeing tour of the Mukteshwar where you get to visit the colonial Jim Corbett�s Bungalow, used during his Tiger Hunting days. Walk up to the Famous Chauli Jaali Cliff with a straightdrop of approx. 2000 Ft. and offer your prayers at the Century Old Lord Shiva Temple. 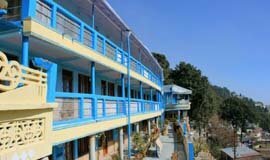 Transfer to Binsar.Check -inn at the hotel.Overnight at Binsar. 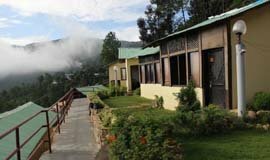 Visit Binsar Wildlife Sanctuary-home to over 200 fauna species ; Binsar Sanctuary Museum- preserving detailed information of flora and fauna of the region; Bineshwar Temple- also known as Bineshwar Mahadev Temple, this ancient temple was erected during the 16th century and is dedicated to Lord Shiva; Golu Devta Temple- around 4 km from the sanctuary, this temple is dedicated to the deity of Kumaon region was who was an incarnation of Gaur Bhairav and Zero Point- this highest point in Binsar sanctuary where one can get majestic views of Himalayas. 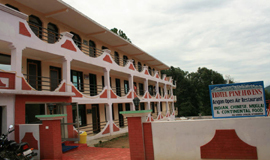 Transfer from Binsar to Kausani.Check -inn at the hotel. 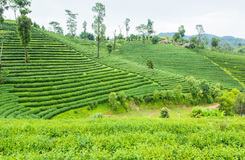 Local sightseeing in Kausani famous for Himalayan Views and Tea Gardens. Overnight at Kausani. 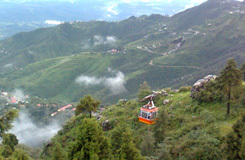 After breakfast, proceed for a local sightseeing tour in and around Kausani (Optional). 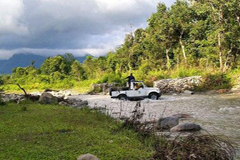 There are many places of interest like the Anashakti Aashram,Pant Museum,Laxmi Ashram,Tea Garden,Pindari Glacier. 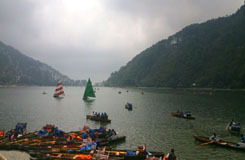 Don't miss boating on the Naini Lake. 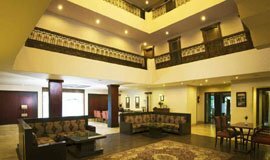 Spend the evening at leisure and stay overnight at the hotel. Trip to Baghnath Temple, Tea Gardens, Rudradhari Falls. Overnight at Kausani. Transfer from Kausani to Nainital via Ranikhet. 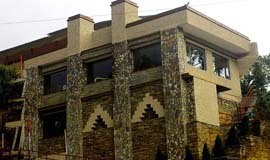 Check-Inn at the hotel. 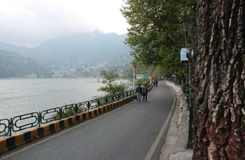 Local sightseeing in Nainital. Overnight at Nainital. After breakfast, proceed for a local sightseeing tour in and around Naintal (Optional). 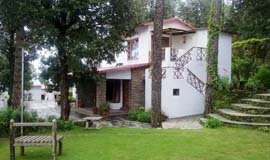 There are many places of interest like the Naina Devi Temple, Lands� End, Tiffin Top and the Zoo. One can also take the ropeway (directly payable by the customer) to the Snow View Point. Don't miss boating on the Naini Lake. Spend the evening at leisure and stay overnight at the hotel. After breakfast, you have the whole day at leisure, you can choose to explore the Mall road, the thandi sadak and /or shop in the famous bhutia markets. Stay overnight at the hotel.. Transfer from Nainital to Kathgodam. Tour Ends with Happy Memories. 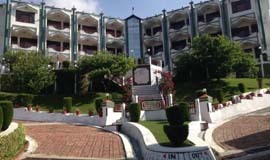 Get best deals on Kumaon Tour 9 Nights Package with the assurance of travelling with locals, stay at best Hotels in Mukteshwar , Binsar Hotels, Kausani Hotels, Nainital Hotels inclusive of meals and transfers from airport/railway station,local sightseeing in and around Nainital. 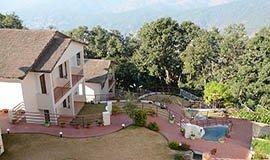 The most popular hotels in above destinations are Alpine Chalet Resort, Binsar Eco Camp, Chevron Eco Lodge, Dyansty Resort to name few. 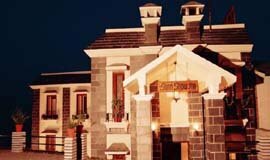 Book Kumaon Tour 9 Nights Package online and get upto 75% OFF in Allseasonsz.com-The best awarded local Nainital travel agent and Uttarakhand Packages specialist offering customised itineraries, supported by local partners and dedicated Allseasonsz team.Be prepared for exclusive experiences,surprise picnics and world class service.